The prospective meeting was the most highly anticipated moment expected during US Vice President Mike Pence's visit to Pyeongchang. US Vice President Mike Pence was all set to hold a historic meeting with North Korean officials during the Winter Olympics in South Korea, but Kim Jong-un's government cancelled at the last minute, the Trump administration said on Tuesday. A potential meeting between Pence and the North Koreans had been the most highly anticipated moment of the vice president's visit to Pyeongchang, South Korea, where he led the US delegation to the opening ceremonies. Ahead of Pence's visit, Trump officials had insisted they'd requested no meeting with North Korea, but notably left open the possibility one could occur. There was no indication that a meeting had indeed been planned – and then cancelled on short notice – until Tuesday, more than a week after Pence returned to the United States. The US Department of State said that Pence had been "ready to take this opportunity" but would have used it to insist Pyongyang abandon its nuclear weapons and ballistic missile programmes. 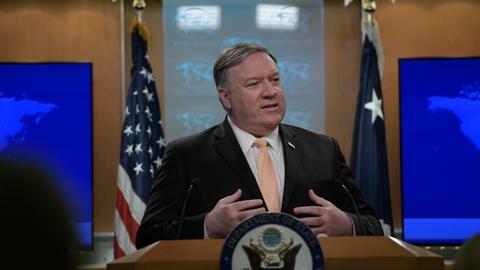 "At the last minute, DPRK officials decided not to go forward with the meeting," said state department spokeswoman Heather Nauert, using an acronym for the North's formal name, the Democratic People's Republic of Korea. "We regret their failure to seize this opportunity." Nor was it immediately clear whether North Korea scheduled the meeting before the vice president arrived in South Korea or after he had already arrived. The day before landing in Pyeongchang, Pence told reporters that "we haven't requested a meeting with North Korea." "But if I have any contact with them – in any context – over the next two days, my message will be the same as it was here today: North Korea needs to once and for all abandon its nuclear and ballistic missile ambitions," Pence said. A potential high-level interaction between the US and North Korea, which would have broken years of estrangement between the two countries, loomed prominently over the Winter Games, where North Korea made a last-minute move to send its athletes to compete on a combined team with South Korea, the host of the games. Since taking office, the Trump administration has been working to increase economic pressure on the North to abandon its nuclear programmes while also threatening military action, insisting at the same time that a diplomatic solution would be preferable for all sides. Yet for months the Trump administration had offered inconsistent messages about what conditions would be needed for a tete-a-tete – such as whether North Korea would have to agree that its nuclear programme was on the table before the United States would be willing to sit down. Pence's office, acknowledging the scrapped meeting on Tuesday, said North Korea had "dangled a meeting" in hopes that doing so would entice the vice president to ease up on the North. Pence's office suggested that North Korea later bailed because it became clear he would hold firm on the US stance if a meeting did occur. Pence's chief of staff, Nick Ayers, said that the planned meeting – first reported by The Washington Post – would have included an "uncompromising message" delivered by Pence about the "maximum pressure campaign" the Trump administration is waging to try to deter North Korea from proceeding with its nuclear programme. "Perhaps that's why they walked away from a meeting, or perhaps they were never sincere about sitting down," Ayers said. Pyongyang sent its nominal head of state, Kim Yong-nam, the highest-level visitor to the South from the North in recent memory. It also sent Kim Jong-un's sister, Kim Yo-jong. Ostensibly, Pence would have met with one or both of those significant North Korean figures. Pence's guest for the Olympic Opening Ceremonies was Fred Warmbier, the father of Otto Warmbier, the US student who died in 2017 shortly after he was released from North Korean detention. Pence also announced in the run-up to his visit that the Trump administration was preparing to unveil a particularly tough round of sanctions punishing the North for its nuclear weapons programme. Pence's trip came after President Donald Trump days earlier hosted a group of North Korean defectors in the Oval Office, including Ji Seong-ho, whom the president had referenced in his State of the Union address. The White House cast that meeting as part of the Trump administration's "maximum pressure" campaign to counter the North Korean nuclear programme. The plan centres around rallying the international community to further isolate North Korea both diplomatically and economically.